Bernie Parent gave fans of the Philadelphia Flyers quite the pick-me-up on Thursday morning. 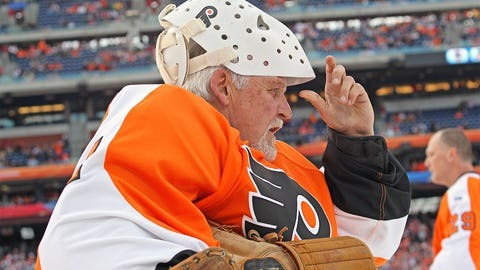 Philadelphia Flyers legendary goaltender Bernie Parent provided an extra jolt for fans of the team on Thursday morning. Parent handed out a free cup of coffee and an orange-and-black donut during his early-morning “shift” at a Dunkin' Donuts in Voorhees, N.J. The 70-year-old worked from 8-9 a.m. to fire up Flyers' fans prior to the team's 2015-16 season opener against the Tampa Bay Lightning later that night. A two-time Vezina and Conn Smythe Trophy winner, Parent wore a smile instead of his unmistakable mask and signed autographs and posed for pictures with fans and the team's Ice Girls.